The successor to the Vactor 2100 Plus, the Vactor 2100i combination sewer cleaner was introduced in 2018 and now features an optional RDB1015 rapid deployment boom. Vactor Manufacturing, a subsidiary of Federal Signal Corporation, showcased tandem- and single-axle configurations of the Vactor 2100i combination sewer cleaner last week at the 2019 Water & Wastewater Equipment, Treatment & Transport (WWETT) Show in Indianapolis. The Vactor 2100i combination sewer cleaner combines proven performance with a new level of operating simplicity that includes IntuiTouch controls and an optional RDB1015 rapid deployment boom. The Vactor 2100i represents the latest in sewer cleaning technology from Vactor Manufacturing, which is currently celebrating the 50th anniversary of the introduction of the first combination sewer cleaner featuring jetting and vacuuming. Vactor Manufacturing was originally founded in Chicago in 1911 as the Myers-Sherman Company, a manufacturer of pneumatic farm equipment. In the mid-1930s, Myers-Sherman moved its operations from Chicago to the community of Streator, Illinois. 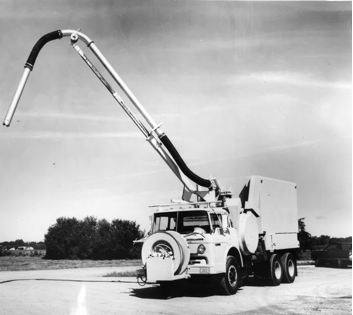 Years later, in the early 1960s, the company began to design and manufacture a line of sewer and catch basin cleaners for the municipal market to clear clogged sewer lines and catch basins. Vactor's first combination sewer cleaner. In 1969, the company introduced the combination sewer cleaner featuring water jetting and vacuuming. That same year, the company introduced the Vactor Jet Rodder Water Pump, the first pump designed specifically for sewer cleaning. The Vactor 2100 Series combination sewer cleaner was introduced in late 1989 and has evolved through continuous improvements, driven by customer needs. Vactor Manufacturing introduced the Vactor 2100i, a revolutionary combination sewer cleaner that combines intuitive simplicity and operational ease, at the 2018 WWETT Show. “As the successor to the popular Vactor 2100 Plus, the Vactor 2100i couples unmatched durability with enhanced ergonomics for complete operator comfort and effectiveness,” Malmassari says. The all-new RDB1015 rapid deployment boom on the Vactor 2100i telescopes 10 feet out and extends the debris hose down 15 feet, minimizing the need for additional tubes, speeding and easing operation in a wide range of dynamic applications. For more information, visit www.vactor.com.